Lee Redmond soaks hers in olive oil. Aaron Studham lathers his in hairspray. They both say it's worth it. Studham, 17, joined the ranks of the weird, wacky and wonderful with the tallest hair on the planet. "It's a real icebreaker with the girls," Studham said of his magnificent Mohican hairstyle proudly peaking at 24 inches. "It started as a dare from my friends," the Massachusetts teenager told Reuters after sharing grooming tips with his fellow record holder at a photocall in a London beauty parlour. "It took me five to six years to grow. I don't wear it up all the time but when I do, it takes about 45 minutes to an hour to put it up. I use hairspray and then blow-dry it." Redmond, who is from Utah, shares a centre spread in Guinness 2007, released on Thursday, with the proud purveyors of the world's stretchiest skin, narrowest waist and longest ear hair alongside a woman who can pop her eyeballs 11 millimetres ( 0.43 inches) out of their sockets. 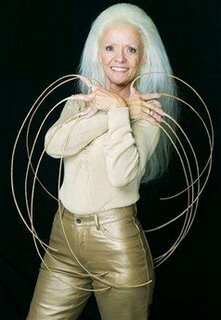 Redmond, who started growing her fingernails 27 years ago, has a meticulous routine to keep them in tip-top condition. "I clean them with a toothbrush when they get dirty and always keep them manicured," she said. Every day she treats them with warm olive oil and nail hardener. However, the lifespan of her phenomenal talons is drawing to a close. "I am going to have to take them off in November as I am looking after my husband who is suffering from Alzheimer's," she explained. She still manages to shave her husband daily, but has to sleep on her side and rest her hands on the bed with her nails hanging off the edge. She has attracted some unusual admirers over the years and was once offered money to have her nails nibbled. The prospective buyer suggested that he buy by the inch. When asked the inevitable question about how on earth she goes to the toilet, Redmond said: "Very carefully."